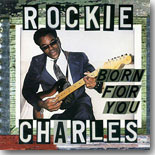 Born For You (Orleans Records), the recently reissued 1996 country soul blues masterpiece from Rockie Charles, has an interesting and unique back story. Charles (born Alfred Charles Merrick) was raised in Boothville, Louisiana and raised by his dad, who was a shrimper and played guitar with a local group. As a teenager, Charles moved to New Orleans to live with an aunt and attended Houston’s School of Music, where he learned to write music and play guitar. Entering in a few talent shows locally gave him the confidence to try to go at a music career. Charles auditioned for Dave Bartholmew at Imperial Records and Allen Toussaint at Minit Records with no success. There he met Senator Jones, who recorded one single with Charles, but it didn’t sell. A subsequent tour with his band, the Gadges, didn’t pan out, so Charles decided to start his own label, Soul Gate, where he released several singles including his biggest, “The President of Soul.” However, the emergence of disco in the mid-’70s began to limit his sales and gigs, so Charles moved to the West Bank, where he became a tugboat captain (he had gotten his river pilot’s license when he turned 18). In the mid-’80s, he let his license expire after several close calls on the Mississippi and began building an oyster boat, writing music in his spare time. In the mid-’90s, he felt good enough about his music to place an ad in Offbeat magazine’s 1994 Louisiana Music Directory announcing that “Rockie Charles, The President of Soul,” was accepting engagements once again. Orleans Records’ chief Carlo Ditta saw the ad and was intrigued enough to call Charles and soon, they started working on Born For You. This is southern soul at its finest. Charles’ voice has drawn comparisons to Al Green in his ability to go from baritone to falsetto with ease, but there’s a hint of Earl King in his relaxed delivery, a little Charles Bradley grit here and there, and maybe a little Percy Sledge on some of the ballads. Nevertheless, he is very much his own man as a vocalist, very distinctive and versatile. He’s also a very impressive tunesmith as well, writing all 11 tracks. The title track opens the disc and it sounds like one of those classic early ’70s smooth tracks from Hi Records, especially with the Hammond B3 in the background and Charles showing his amazing vocal range. “Old Black Joel” is one of those soulful story songs like Clarence Carter used to do, and Charles sings it with conviction (and superb backing from background singers Karlene Arena and Rhea Kahler). “Festus Believe In Justice” is another story song, though with more of a country flair thanks to Fred Koella’s lap steel. “Oh My Darling Look What You’re Doing To Me” is a smoldering soul blues with harmonica from Smoky Greenwell, and “Something Is Wrong With Our Love” and “Don’t Let Me Go” are a pair of sweet classic slow burners. The mid-tempo “Please Tell Me It Ain’t So” blends a little funk with the soul, and the R&B-infused “I Need Your Love So Bad, I’m About To Lose My Mind” would have been all over the radio 40 years ago. Charles’ great vocal, backed by Arena and Kahler, and the smoking horn section (Wilber Tank – trumpet, Jerry Embree – tenor sax, and Sean Kenny – baritone sax) make for an awesome combination. Despite the title, “I Like To Make Love When It’s Pouring Down Rain” is actually an upbeat tune that should get feet in motion, and “There’s A Rainbow Hangin’ Over My Shoulder” proves that Charles’ economical guitar work is as impressive as his singing. There’s also the seasonal “I Just Called To Wish You a Merry Christmas,” which features one of Charles’ best vocal performances. When Born For You was initially released in 1996, it earned favorable reviews all around and led to more work for Charles, who continued to work and record, releasing two additional albums in 2002 and 2009. He passed away at 67 in 2010, after a long battle with cancer. Any fan of soul music needs a copy of Born For You in their collection. It’s easily one of the best albums of the genre to emerge during the 1990s. All contents Copyright © 2018, Blue Night Productions. All rights reserved.